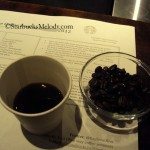 Two new Starbucks Reserve coffees were introduced into Clover Starbucks stores on September 18, 2012: Sun-Dried Sumatra and Panama Paso Ancho. They are both good but the Sun-Dried Sumatra will pretty much knock your socks off. Usually, Sumatra coffees are semi-washed, so this is very new thing for Starbucks to offer a Sun Dried Sumatra. In fact, it is the first time Starbucks has offered a “Sun-Dried” Sumatra. 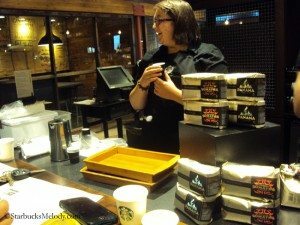 Today (September 17, 2012), I went to a great coffee seminar at the Olive Way Starbucks that introduced these two new coffees. Starbucks Coffee Master Megan conducted tonight’s event. There was a very large group for tonight’s event – I would say that about 14 to 16 people showed up. 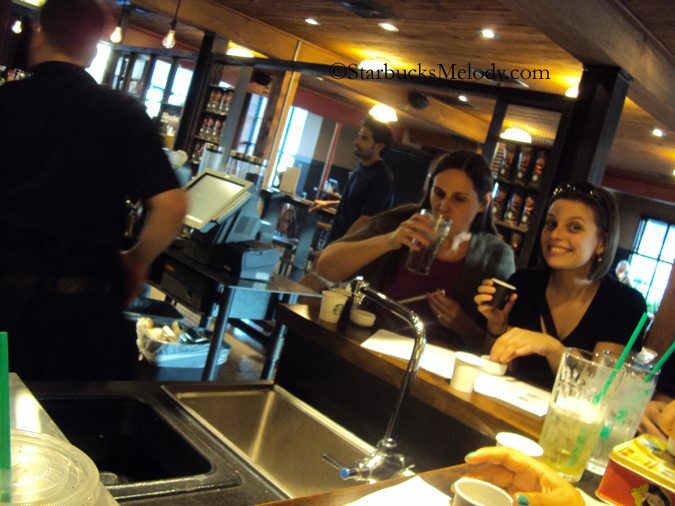 We walked through all four steps of a coffee tasting. First we smelled the coffee, and noticed the aroma. Secondly, we took a big slurp, aerating the coffee in the mouth. And thirdly, we located where the flavor notes hit in the mouth. And lastly, we described the coffee. 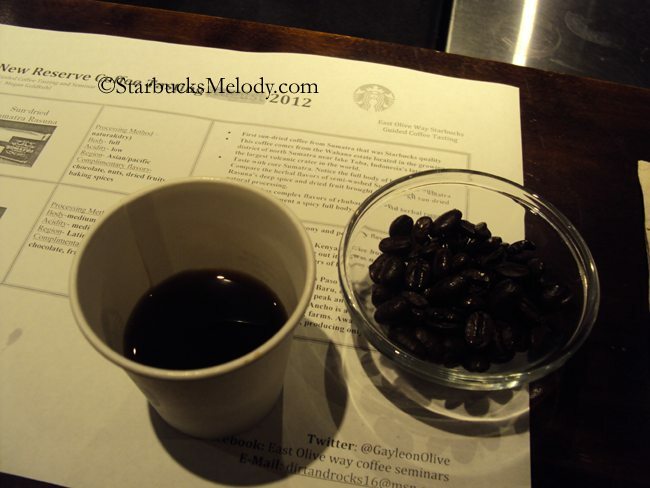 The more fruity/ berry notes from this being a sun-dried coffee were very evident during this tasting. Unlike an Ethiopian sun dried coffee (Harrar, for example), this coffee had more of rhubarb and jammy flavor notes. In other words, a sun-dried coffee from an African growing region would be expected to have a lot of blueberry and cherry flavors, whereas this coffee had dried fruit and rhubarb flavors and some complex herbal flavors. This is an amazing coffee. 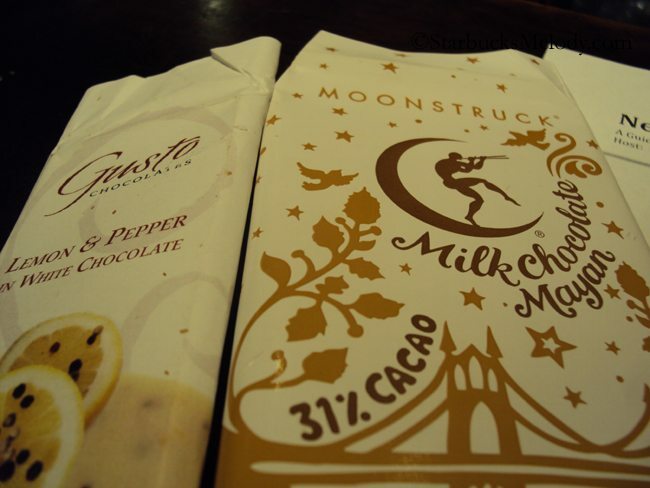 Megan paired this coffee with a Moonstruck milk chocolate from The Chocolate Box. She picked a “Mayan” toasted almond cinnamon chocolate which was rich with strong cinnamon flavors. The cinnamon brought out the herbally spice notes. Really a great pairing. Coincidentally, earlier this week I was having a twitter conversation with a Starbucks coffee master partner in the UK. He mentioned that Howard Schultz had just been in the UK last week. Howard told a UK partner that this was “the best coffee he’d ever had,” or so I hear. Of course, that’s the classic definition of “hearsay” when you hear something second-hand, but still, it’s a resounding endorsement of this coffee that it’s so well-loved by Howard! The Sun Dried Sumatra Reserve is a dark roast coffee. One can see an oily shine to the bean, showing that it’s been through a deep roasting, enhancing its complexity. This coffee is sourced from the Lake Toba region of Sumatra, which is a growing region famous for extremely high quality, lovely coffees. A few years ago, Starbucks offered a semi-washed Lake Toba coffee which was available in only a limited number of international markets. You can also buy Sun Dried Sumatra through StarbucksStore.com. 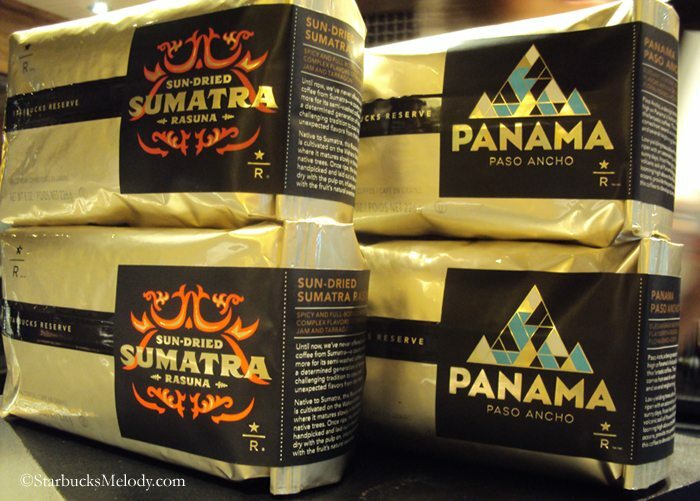 The Panama Paso Ancho Reserve is a medium-bodied coffee with lots of lemon pepper flavor. Several people in our group all thought that this is the perfect coffee to pair with a lemon pepper chicken. 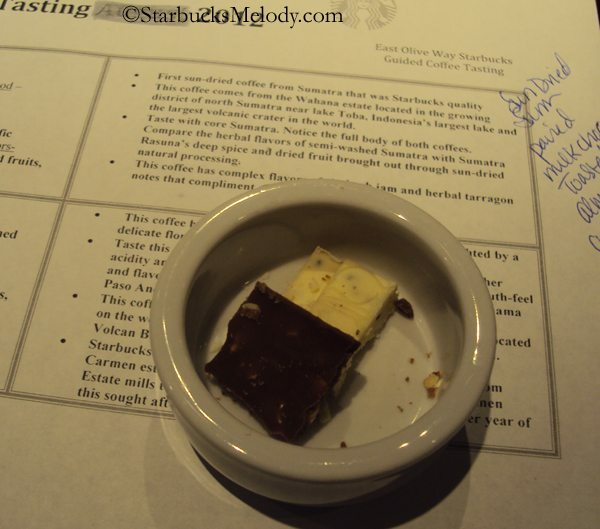 Megan paired this coffee with a lemon pepper white chocolate, also from The Chocolate Box. The pairing was superb. It brought the flavor notes of this coffee to life. I think people will either love this coffee … or not! It’s an unusual and distinctive flavor. The next day after this coffee tasting, I tried this coffee iced from the Clover too. It’s quite an interesting coffee. I think you have to like pepper as a flavor note to like this. Be sure to try it and tell me what you think. I can’t quite get into this coffee. 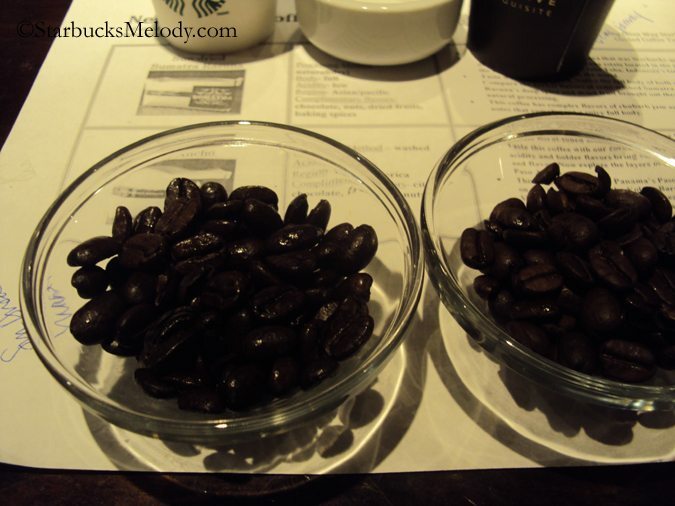 I think it’s interesting to compare the beans from the two coffees side by side. It’s obvious which is which! Here is what the chocolates looked like, in case you want to go find these delicious treats. 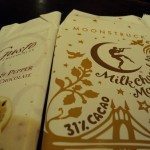 Just trying these chocolates was a lot of fun too! Coffee Master Jess joined in the audience too, and was full of smiles! Don’t forget, if you want to go to an Olive Way coffee event, they are usually every other Monday evening at 6:00 p.m. However, you should call ahead because they sometimes vary their schedule depending on when new coffees are released, and their partners’ availability. I must try the Sun Dried Sumatra. Hopefully it will be something I can get my hands on when I’m in Houston, because between now and then I am far too busy to go to the closest Reserve store (which is not close) to get some. Thanks for this, Melody. I’m to the point that I need to hear something fun and uplifting about Starbucks! I so enjoy reading about this Olive Way store. It just amazes me how these coffee seminars are by you and just around here they are virtually nonexistent. I can’t wait to try the Sumatra! I’ll have to take a trip to Streets this weekend! Since I am in the desolate remote wilds of Southeast Washington State (better know as the Columbia Territory) 😉 I am having to wait for my delivery of Sun Dried Sumatra. I think it is coming by mule train. 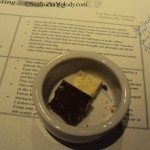 I am so glad you got this tasting experience and were able to share it with us. Thanks. @DadCooks – You will love it! It will be worth the mule transport. 😉 Just had it again on my way into work. @Purple1 – This store is amazing. I was sort stunned – I mean really stunned – to meet a partner who transferred to this store largely for its coffee passion. I met a nice young guy at this Sumatra coffee tasting who said he transferred to Olive Way from out of state because he really wanted to grow his coffee knowledge and Starbucks career, and he’d been reading my blog, and knew he had to come to THIS store. I’m impressed with that coffee dedication! @Michelle – I think there are 3 Clover stores in Texas now, but I’m not sure if Houston has one. I desperately need to work on my Clover list. No time! I hope you get some of this coffee! Melody what a great compliment to you that the partner transferred to Olive Way because of reading your blog. Just goes to show that your writing has an impact on people. Thanks. Purple 1, On my Kindle, sorry short and sloppy. I think it’s flattering to spread passion and be a vehicle for that. Even more amazing, what dedication to Starbucks as both a brand and a coffee company to pick up your bags and move to a new state for your employer! I tried The Sun Dried Sumatra today and enjoyed it on the Clover. I may have to go get that Sumatra today. I cannot wait to try to get my hands on a bag of this coffee. Sumatra blends are my favorite so this one should be excellent. Thanks for the heads up! I was hoping you’d post on this – I’ll be trying it soon. 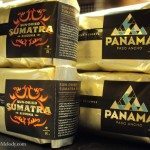 Sumatra is one of my favorites. Very interesting! I sure feel like I’m getting an education when I read your blog! I do like Sumatra, can’t wait to try the sun-dried.